Freezing rain and sleet lashed parts of the state over the weekend, leading to outages in parts of the Piedmont, Triad and Western North Carolina. 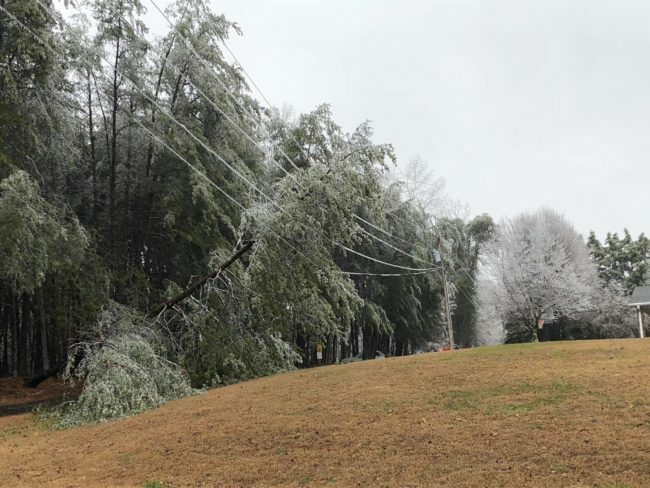 EnergyUnited and Surry-Yadkin EMC were among those with downed trees and power lines affecting members, although crews joined in restoration efforts from Blue Ridge Energy, Piedmont Electric, Randolph EMC, Rutherford EMC, South River EMC and Union Power Cooperative. In addition, Central Electric, Jones-Onslow EMC and Pee Dee Electric sent crews to Southside Electric Cooperative in Virginia. Total co-op outages reached 13,000 Sunday. Duke Energy reported an additional 50,000 without power over the same period. Most outages were concentrated in Forsyth, Henderson, Rockingham and Stokes counties. By Tuesday morning, power was restored to all but a few co-op members. A tree rests on a power line in the service territory of Surry-Yadkin EMC.